&lt;&gt; at Sun Life Stadium on September 22, 2013 in Miami Gardens, Florida. The Miami Dolphins traded up to take DE Dion Jordan third overall in the 2013 NFL Draft. After limited playing time in his first two seasons he was suspended for the entire 2015 season and missed all of 2016 with a knee injury. He was released by Miami in March after failing a physical, having made just three sacks in his NFL career. Jordan’s pass rushing productivity (PRP) was a respectable 9.2 in 2014, though he was limited to 101 pass rushing snaps. 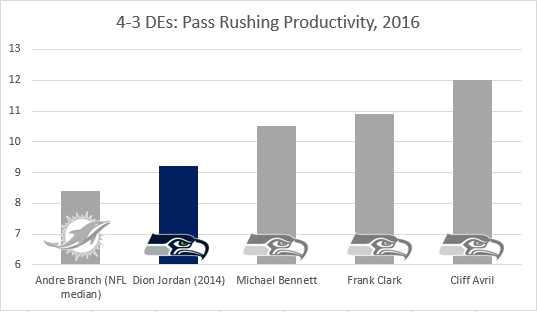 Though clearly a player with potential, Jordan will face stiff competition for playing time at defensive end in Seattle as Cliff Avril’s PRP was 12.0 (fourth in NFL among 4-3 defensive ends), Frank Clark’s was 10.9 (T-eighth) and Michael Bennett’s was 10.5 (T-13th).